Suits is an American legal drama television series created and written by Aaron Korsh. The series premiered on June 23, 2011, on USA Network, and is produced by Universal Cable. It is the network's longest running original series in terms of seasons and episodes. Suits is set at a fictional law firm in New York City, and follows talented college dropout Mike Ross (Patrick J. Adams), who begins working as a law associate for Harvey Specter (Gabriel Macht), despite never attending law school. The show focuses on Harvey and Mike managing to close cases, while maintaining Mike's secret. The show also features the characters Louis Litt (Rick Hoffman), Rachel Zane (Meghan Markle), Donna Paulsen (Sarah Rafferty), and Jessica Pearson (Gina Torres). On January 30, 2018, the series was renewed for an eighth season without Adams and Markle, and Katherine Heigl joined the cast as Samantha Wheeler. Recurring characters Alex Williams (Dulé Hill) and Katrina Bennett (Amanda Schull) were promoted to series regulars. The show was renewed for a 10-episode ninth and final season on January 23, 2019. 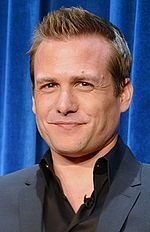 Throughout its run, Suits has been nominated for several awards, with Torres and Adams receiving individual praise. On top of two nominations recognizing her role as a supporting actress, Torres was awarded Outstanding Performance in a Television Series at the 2013 NHMC Impact Awards. Adams was nominated for Outstanding Performance by a Male Actor in a Drama Series at the 2012 Screen Actors Guild Awards, and the show itself has been nominated for two People's Choice Awards.